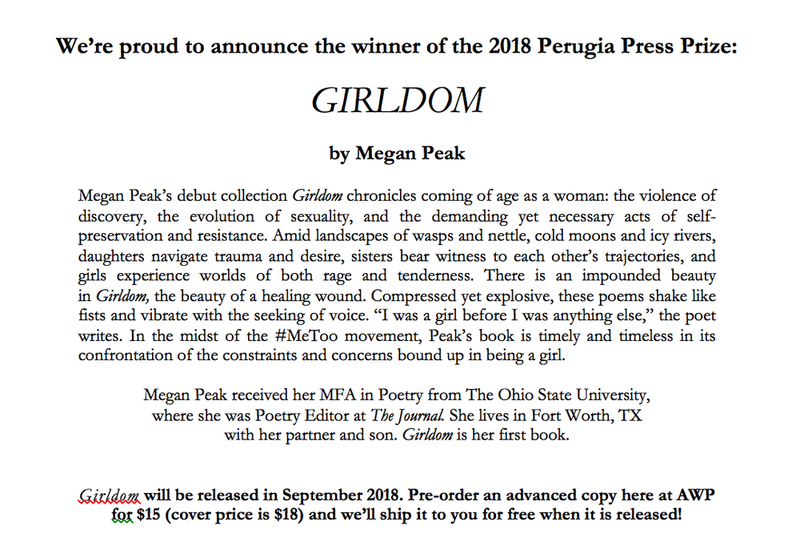 Girldom Wins 2019 Best First Book of Poetry from Texas Institute of Letters. What a year it has been for Girldom! Thank you to the Texas Institute of Letters for awarding Girldom with The John A. Robertson Award for Best First Book of Poetry. I will be attending the awards reception in McAllen, TX on April 26-27! 2018 Perugia Press Prize Winner for Best New Woman Poet! This poem was so incredibly difficult to write, but I am so thankful for the people at Vinyl Poetry and Prose for giving this poem a home. This type of violence is still considered so taboo to talk about, and I just hope this gives someone the courage/motive/energy/hope to write what you need to write. Come out to Wits End in Deep Ellum for a great night of poetry! Event starts at 7PM sharp, and I will be reading with some fantastic writers! Honored to have a poem in this stunning issue of art and language. You can download the issue here. Here's a link to The Review Review's write-up about the Ploughshares issue that houses my poem, "Titration." Happy to have two poems in the new issue of Up the Staircase Quarterly! My poem "Proposal With One Light On" is up at Red Paint Hill among some other brilliant poets like Sam Sax and Rachel Marie Patterson. So pleased to have my poem "As Girls--" in such a smart and beautiful issue at Radar Poetry. Thanks to Rachel and Dara-Lyn for giving this poem a home! Excited to have a poem featured on Verse Daily. "Before Spring" was originally published by Ninth Letter. Honored to have been asked to read my poem "The First Book," which is featured on Indiana Review's Bluecast Blog. The poem first appeared in the Summer 2015 issue. New Poem Up at Linebreak! I am really excited to have a poem with hay bales, embers, and sad girls up at Linebreak! Though my manuscript wasn't selected this time, it was an honor to be chosen as a finalist for the 2015 Levis Prize in Poetry from Four Way Books! I will be reading at Kettle Arts in Dallas, Texas as a part of the Pegasus Reading Series! Follow the link for more details. Where: Kettle Arts, 2650-B Main St. I have three new poems in the new issue of Ninth Letter and one poem in The Pinch's 35th anniversary issue! Check them out. Thanks to Geramee Hensley for asking smart and fun questions during our interview at ReCap Magazine. Check it out! Thanks to April Michelle Bratten and the people at Words Dance Publishing for saying kind things about my poem, "In Monteverde," from MUZZLE magazine.